Creating exceptional work spanning over five decades, the pop art legend Peter Max has mastered the craft of design and color in his ever evolving brand of avant-garde paintings. 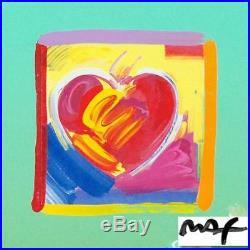 "Heart Series" is an original acrylic mixed media on paper, hand-signed by Peter Max! 8.5" x 11" (no border). European born, Peter was raised in Shanghai, China, where he spent his first ten years. He lived in a pagoda-style house situated amidst a Buddhist monastery, a Sikh temple and a Viennese cafe. And yet, with all that richness and diversity of culture, he still had a dream of an adventure yet to come in a far-off land called America. Though it was a relatively short stay, Peter enrolled in an art school and absorbed the culture and art heritage of Paris. At the age of sixteen, Peter realized his childhood vision and arrived in America. After completing high school, he continued his art studies at The Art Student's League, a renowned, traditional academy across from Carnegie Hall in Manhattan. Here, Peter learned the rigid disciplines of realism and developed into a realist painter. As a painter for four former U. Presidents (Carter, Ford, Bush and Reagan) in 1993, Max was approached by the inaugural committee to create posters for Bill Clinton's inauguration. He was later invited to the White House to paint the signing of the Peace Accord. Always an optimist, Max sees a fabulous new age for the new millennium, filled with enormous possibilities. He also sees a need for a greater responsibility to our planet, and he is ever ready to serve as the Global Artist. Feel free to ask any questions or to check with me on the details of my promotions. 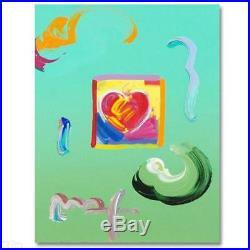 The item "Peter Max Heart Series ORIGINAL Acrylic Mixed Media" is in sale since Saturday, May 08, 2010. This item is in the category "Art\Art Prints". The seller is "sweetwater*gallery" and is located in Sewickley, Pennsylvania. This item can be shipped to United States, Canada, United Kingdom, Denmark, Romania, Slovakia, Bulgaria, Czech republic, Finland, Hungary, Latvia, Lithuania, Malta, Estonia, Australia, Greece, Portugal, Cyprus, Slovenia, Japan, Sweden, South Korea, Taiwan, South africa, Belgium, France, Hong Kong, Ireland, Netherlands, Poland, Spain, Italy, Austria, Israel, Mexico, New Zealand, Singapore, Norway, Saudi arabia, United arab emirates, Qatar, Kuwait, Bahrain, Croatia, Malaysia, Colombia, Jamaica, Indonesia, Panama, Barbados, Bangladesh, Bermuda, Brunei darussalam, Bolivia, Ecuador, Egypt, French guiana, Guernsey, Gibraltar, Guadeloupe, Iceland, Jersey, Jordan, Cambodia, Cayman islands, Liechtenstein, Sri lanka, Luxembourg, Monaco, Macao, Martinique, Maldives, Nicaragua, Oman, Peru, Pakistan, Paraguay, Reunion, Thailand, Germany, Ukraine.